Click here to go to the official ladder for your region! Click here to see the current player rankings for your region! WHAT IS THE GEARS PRO CIRCUIT? Now in its second season, and boasting an expected $2,000,000 prize pool, the Gears Pro Circuit is Gears of War 4's Esports program, slated to run September 2017 to December 2018. Open to players of all skill levels from around the world, the Circuit features both regional online competitions, as well live major events, where players come together to compete for massive cash prizes in front of thousands of fans in house and on the Gears Esports live channel, live.gearsofwar.com. In addition to these major broadcasts, the Gears Pro Circuit also features Wednesday Gears Fight Night broadcasts, which showcases some of the best pro and up-and-coming teams from around the world each week. HOW DOes the Gears Pro Circuit Work? In short, the Gears Pro Circuit runs on Gears Pro Points, which are earned by playing in regional MLG GameBattles online ladders, weekly online tournaments, and live LAN events around the world. 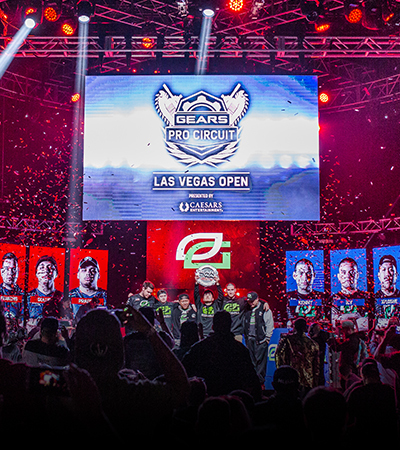 The Gears Pro Points earned by an individual player are then added to their teammates' upon registering for a tournament, with the total being used to determine event seeding and travel coverage. The ladder is open 24/7, allowing you to earn Gears Pro Points around the clock. Each registered member of your winning ladder team gets 5 Pro Points for each win, along with an additional 10 points for your first win of the day. 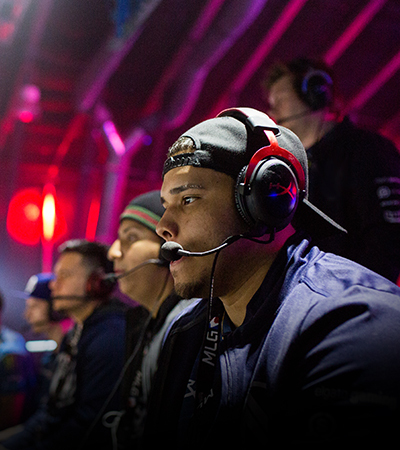 MLG GameBattles will also be hosting weekly online tournaments where you can win even more Gears Pro Points. The 2000 Series Tournaments (on Sundays) are weekly single-elimination online tournaments with the winning team members each getting 2000 Pro Points along with points from 2nd place (1200 points) through 32nd (200 points). In addition to a share of the estimated $2,000,000 USD prize pool, your wins and placings at a LAN event will award you the largest number of Gears Pro Points on the biggest stage. Top teams (via Gears Pro Points team ranking) from each region may also qualify for free travel to certain LAN events. Check the event schedules in the menu for more information. The first thing you need to do is read the Gears Pro Circuit Program to familiarize yourself with the match settings and rules, as well as the Gears Esports Code of Conduct, which all players are expected to adhere to during all online and/or live competitions. Once you're familiar with everyhing, the next thing you need to do is create an MLG GameBattles account, link your gamertag and create a team. You can create your account by clicking here, or by clicking here for step-by-step instructions. WHAT DAYS DO THE EVENTS TAKE PLACE ON? We recommend booking off Wednesdays and Sundays from work/school; weekly tournaments are on Sundays (check Gamebattles page for the start time in your region), and weekly Fight Night Broadcasts take place every Wednesday at 3 PM PDT / 5 PM CDT / 6 PM EDT / 10 PM GMT / 12 AM CEST. If you are a semi-finalist or finalist in a weekly tournament, we may ask you to hold back on playing the finals until the Wednesday Fight Night Broadcast. Live LAN events typically take place on weekends, with tournaments kicking off on Friday and concluding Sunday night. Have a busy schedule? Don't worry! The Gears Pro Circuit is completely open, so you can pick and choose what tournaments you want to participate in to earn Gears Pro Points, and the ladders are open 24/7! CAN I EARN PRO POINTS IN MORE THAN ONE REGION? No, Gears Pro Points are region locked to the region you live in. You may not play in another region, and all the players on your team must live in the same region. If you are unsure of which region you should participate in then check out the handbook by clicking here. If you're still not sure, then please contact MLG by email: gearspropoints@mlg.tv. HOW MANY GEARS PRO POINTS CAN I EARN? There's no limit! 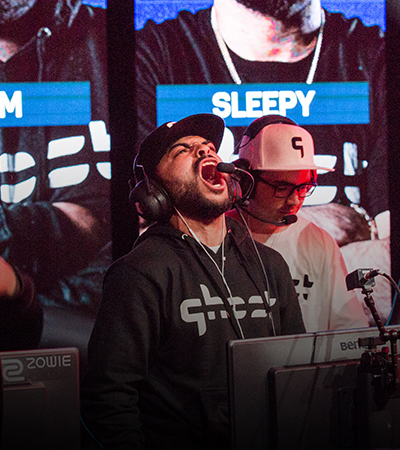 Keep grinding and become a pro by earning Gears Pro Points. "Point decay" will take place at certain points during the program to make sure new teams joining mid-circuit will still have a chance to participate. No, our ladders are completely free and we will be offering free entry 2,000 Series Tournaments each Sunday. Ticket fees may be charged for spectators and teams attending live events. The Gears Pro Circuit is an 18+ program. For live events, competitors must be 18 years of age or older. Exceptions may be made for players 16 & 17 years of age with a parental consent form. Spectators must be 13 years of age or older with parental consent form, and spectators under 16 years of age will need to be accompanied by a parent or legal guardian. Online competitions may be entered by players 13+ with the supervised purchase from a parent or guardian for any players under the age of 18. Please make sure to check the individual event listings for specific age guidelines, as this may change or vary by region. WE THINK OUR TEAM IS LIKELY TO QUALIFY FOR TRAVEL TO AN EVENT. SHOULD WE STILL PURCHASE TRAVEL IN ADVANCE OF THE ROSTER SUBMISSION DEADLINE? Team passes and accommodations are often limited with events. Teams should check event pages first for specific rules and information around travel for qualifying teams. If you still need help, email gearsprocircuit@microsoft.com. How does the live.gearsofwar.com site work? Please visit this page for questions regarding the Gears Esports Live site (broadcasts). You can also use the Official Gears of War Discord chat (via web or phone app) to ask questions, interact with the developers, find players to team with, and find scrims (practice matches) in your region and around the world.